Not far from Brisbane, perfectly situated for a weekend family trip, is the vibrant coastal town of Rainbow Beach. If you can make it a longer trip, you can happily explore the incredible beauty of Noosa and the Magical Cooloola coast as well. Whether you’re an adventure seeker or the relaxed beach-bum type, Rainbow Beach has something for you. The Great Sandy Strait and Fraser Island beckon sailors with their fabulous coasts and magnificent wildlife, marine life and marine life. You can charter a sailboat from Rainbow Beach’s Carlo Marina. You can anchor your sailboat at Fraser Island and enjoy island walks and fishing. You can fish anywhere on the 100 kilometer stretch of beach, for Tailor, Dart, Bream, Whiting, Jew and Flathead fishes. Go estuarine fishing at Tin Can Bay Inlet and the Great Sandy Strait if you have a boat. Boat ramps are located at Carlo Point and Bullock Point. Reef fishers can charter trips to the plentiful offshore reef and catch some Sweet Lip, Snapper, Red Emperor, Pearl Perch, Coral and Parrot Trout.Double Island Point is terrific for rock fishing enthusiasts, and crab fishers should head right up to Tin Can Bay Inlet. The beautiful beaches with their colored sands and erratic dunes offer a challenging prospect for a 4WD experience. If you want greater diversity of scenery, head out to the surrounding national parks with your vehicle. Wolf Rock near Rainbow Beach is a great spot for scuba diving, with plentiful marine life and colorful reefs underwater. Surfing, kiteboarding and windsurfing are favorite sports at Rainbow Beach. Just your gear at a nearby surfing rental and head out to Double Island Point for a day on the waves. For those with the need for a bigger adrenalin rush, we recommend that they take to the skies. Skydiving from 14,000 feet high with the magnificent panorama of the colorful, diverse Rainbow Beach, incredible Fraser Island and the lush Cooloola region is really something. If heights are not your thing, then opt for paragliding or hang gliding. Take off from one of the many towering sand cliffs in Cooloola National Park and glide over the spectacular rainforests, freshwater lakes and heathlands. Carlo Sand Blow is one of the world’s top ten para-and-hang gliding spots. The ancient aboriginals lived in the caves that have formed over millennia in the nearby towering sandcliffs. 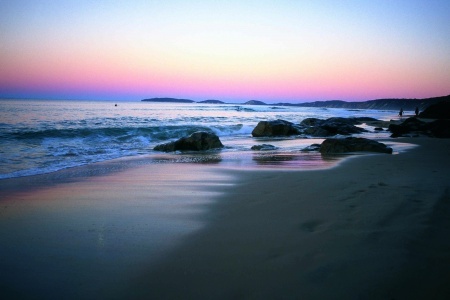 Explore the colorful Cooloola region between Noosa and Fraser Island. Here you’ll find an enchanting paradise of rural hinterland, waterways, beaches and a sprinkling of cultural heritage. The Cooloola National Park is a 56,000 hectares large, full of fragrant coastal cypress pine. The park is rich with vast tracks of open wallum heathland, and mangroves. It is well known for its many towering sand dunes, each one brightly colored by nature. There are also crystal clear lakes and beautiful tropical rainforests here. Explore the long beaches and the high dunes, pick the beautiful wildflowers, and enjoy the tranquil lakes and waterways.